Thick stemmed succulent with sword shaped pale green leaves. Long arching flower stem with tiny yellow flowers spring to summer. Evergreen. Hardy. Sun. 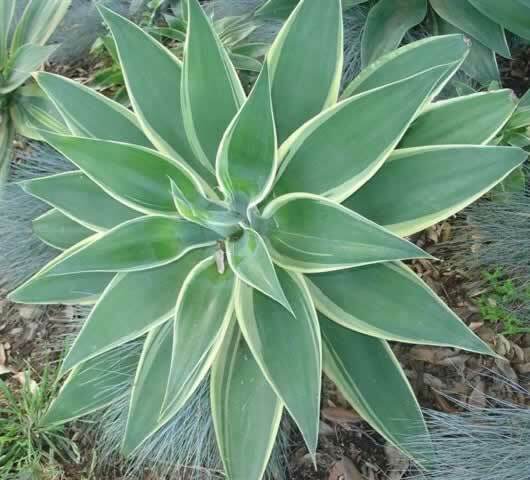 Attractive rosette forming perennial, with deep green pointed leaves. Evergreen. Hardy. Sun to semi shade. Indigenous. Much-branched succulent with fleshy leaves and orange-red flowers in winter. Evergreen. Hardy.Sun. Indigenous. Long, narrow, arching leaves in a dull green. Rose-pink to orange flowers, tipped with green. Flowers in winter. Evergreen. Sun. Indigenous. Clump forming aloe with narrow grey green leaves. Dull pink to coral-red flowers in winter. Attracts birds. Drougt resistant. Evergreen. Sun. Indigenous. Green succulent leaves with white specks. Orange flowers on long stalks in summer. Drought resistant. Evergreen. Sun. Indigenous. Single-stemmed succulent with fleshy leaves. Erect orange flower spikes in winter. Evergreen. Hardy. Sun. Indigenous. Large single stemmed aloe with boat shaped leaves. Flower stalks are branched with orange-red to yellow flowers in winter to spring. Attracts birds. Drought resistant. Evergreen. Sun. Indigenous. Fast growing aloe with a dense rounded shape and greyish leaves. Delicate orange to yellow flowers in spring to autumn. Evergreen. Sun. Indigenous. Single stemmed succulent. Branched flower spikes, with yellowish-orange flowers in winter. Tolerates salt spray. Evergreen. Semi Hardy. Sun. Small shrub with succulent leaves from the Cape Verde Islands. Evergreen. Semi Hardy. Sun. Indigenous. Succulent, bright green leaved grondcover with small pink-red vygie like flowers from spring to summer. Fast growing, good for embankments. Evergreen. Sun. Indigenous. Succulent, clump forming plant for dry areas. Decorative orange flowers spring to autumn . Evergreen. Hardy. Sun. Indigenous. Bulbous plant with fleshy green leaves. Spikes of yellow flowers borne in summer to early autumn. Leaves rich Vitamin E. Evergreen. Hardy. Sun. Evergreen succulent plant that forms rosettes of greyish-green leaves and bears bell-shaped pink flowers with yellow tips in summer. Can be used for groundcover or in pots. Full sun.